US computer giant Dell has won the Green Electronics Council Catalyst Award 2015 for its adoption of 100% post-consumed recyclates (PCR) for certain components. The Catalyst Award is a global celebration of innovative solutions and tangible environmental accomplishments throughout the lifecycle of electronic technologies. 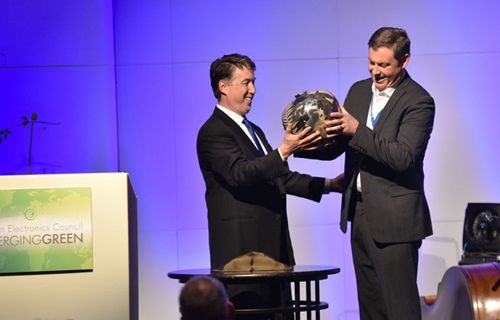 Dell was presented the award during the Emerging Green Conference organized by the Council in the US. A third-party Judging Committee managed by the American Association for the Advancement of Science (AAAS) selected Dell as the winner from among 10 Catalyst Award finalists. Dell’s Catalyst Award nomination outlined how the company uses recycled content from old electronic devices to make new Dell products, establishing a circular flow of materials. The company’s OptiPlex 3030 All-in-One, introduced in 2014, was the first of its products to contain certified closed-loop, recycled-content plastic. Between January 2014 and August 2015, Dell reportedly used more than 10 million pounds of PCR in its products. Cumulatively, the company has used 4.2 million pounds of closed-loop recycled-content plastic across 34 products globally through its closed-loop supply chain, turning waste into a resource.